While water is perceived to be one of the simplest substances in the world, modeling its behavior on the atomic or molecular level has frustrated scientists for decades. To date, no single model has been able to accurately represent the plethora of water’s singular characteristics, including the fact that it is densest at a temperature slightly higher than its melting point. A new study from the U.S. Department of Energy’s (DOE) Argonne National Laboratory has achieved a breakthrough in the effort to mathematically represent how water behaves. To do so, Argonne researchers used machine learning to develop a new, computationally inexpensive water model that more accurately represents the thermodynamic properties of water, including how water changes to ice at the molecular scale. In the study, researchers at Argonne’s Center for Nanoscale Materials (CNM) used a machine learning workflow to optimize a new molecular model of water. They trained their model against extensive experimental data to generate a highly accurate molecular-scale model of water’s properties. The CNM is a DOE Office of Science User Facility. Optimizing model parameters for water has long been a challenge, and more than 50 different water models currently exist, according to Argonne nanoscientist Subramanian Sankaranarayanan, the study’s corresponding author. Trying to create quantum mechanical or atomistic models to capture water’s behavior had flummoxed researchers because they are so computationally intensive and still fail to reproduce many temperature-dependent properties of water. According to Henry Chan, Argonne postdoctoral researcher and the lead author of the study, this is even more difficult to achieve for simple models, such as the one used in this study. For the researchers, the choice to use entire water molecules as the fundamental unit in the model allowed them to perform the simulation at low computational cost. “While traditionally these simple models introduce a number of approximations and often suffer from poor accuracy, machine learning allows us to create a much more accurate model while maintaining simplicity,” said University of Louisville assistant professor Badri Narayanan, a co-first author of the study. However, even with this reduced computational expense, some physical properties can be difficult to simulate without large-scale supercomputers. The team used the Mira supercomputer at the Argonne Leadership Computing Facility, a DOE Office of Science User Facility, to perform simulations of up to 8 million water molecules to study the growth and formation of interfaces in polycrystalline ice. To achieve the high accuracy of the coarse-grained model, the researchers trained the model using information drawn from nearly a billion atomic-scale configurations involving temperature-dependent properties that are well known. ​“Essentially, we said to our model, ​‘look, this is what the properties are,’ and asked it to give us parameters that were able to reproduce them,” Chan said. The researchers also showed that their approach could be used to improve the performance of other existing atomistic and molecular models. ​“We were able to significantly improve the performance of existing high-quality water models using our hierarchical approach. In principle, we should be able to revisit all molecular models and help each one of them attain their best performance,” Sankaranarayanan said. A paper based on the study, ​“Machine learning coarse grained models for water,” appeared in the January 22 online issue of Nature Communications. Other Argonne authors included Chris Benmore, Stephen Gray, and Troy Loeffler. The researchers used computing resources at the Argonne Leadership Computing Facility, CNM, and Argonne’s Laboratory Computing Resource Center, as well as the National Energy Research Scientific Computing Center, a DOE Office of Science User Facility at Lawrence Berkeley National Laboratory. The research was funded by DOE’s Office of Science. Molecular dynamics simulations based on machine learning show how grains of ice form and coalesce in supercooled water, which results in ice with imperfections. These simulations help scientists learn about the movement of the boundary between ice grains (yellow/green/cyan) and the stacking disorder that occurs when hexagonal (orange) and cubic (blue) pieces of ice freeze together. This information is important in applications such as climate modeling and cryogenics. 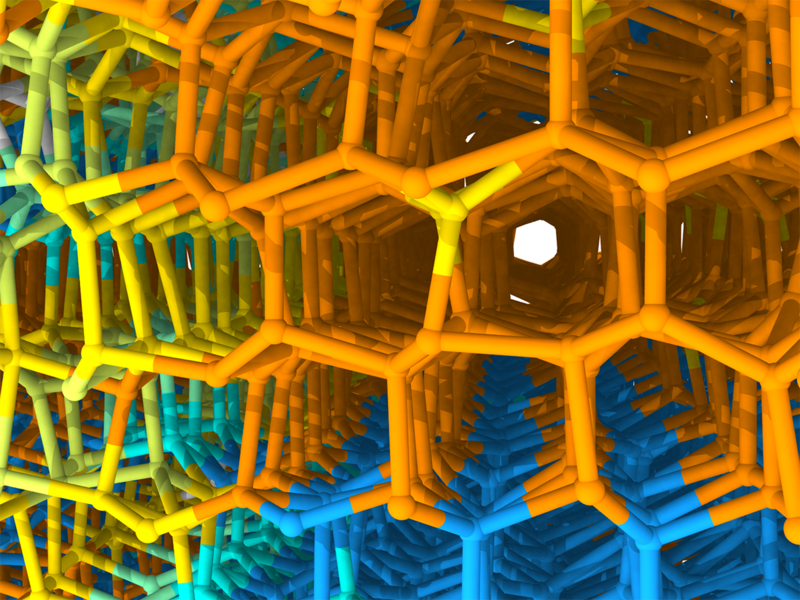 Researchers performed these simulations on Mira at the Argonne Leadership Computing Facility and Carbon at the Center for Nanoscale Materials; ALCF and CNM are both DOE Office of Science User Facilities.